OVER 30 ALL-NEW, SURE-TO-PLEASE PARTIES FOR KIDS OF ANY AGE! Whether your two-year-old's passion is teddy bears, your eight-year-old can name every dinosaur in the museum, or your sweet-sixteen-yearold wants a sophisticated casino evening -- you can create the perfect party with The Penny Whistle Birthday Party Book. Believe it or not, almost every child we've ever talked to claims his or her best birthday parties have been the ones held at home. This doesn't mean spending a lot of money or planning a lavishly, overly produced party, but rather spending your time and energy with your child. The dividends of this investment will last far beyond the actual party day. This is your child's party, and it should be as uniquely and personally his or hers as you can make it. Anyone can hire a party planner to "do" a party. There's nothing personal about it, and there will be another two dozen just like it. Child psychologist (and parent) Dr. Lee Salk says: "There is an attitude nowadays in our society that other people can do things better for your children. That's just not true. There is nothing personally creative about hiring someone else to put together your party. And the messages to the child are: I can't be bothered with doing it myself. I don't have the time to do this for you. I can't wait for this to be over. I don't want to mess up my house. I don't want to be involved so I'll give you this prepackaged (and often expensive) party." By delegating the creating, planning, and giving of your child's party to an outsider you will find that you are missing a great opportunity for your family to share a special experience together. 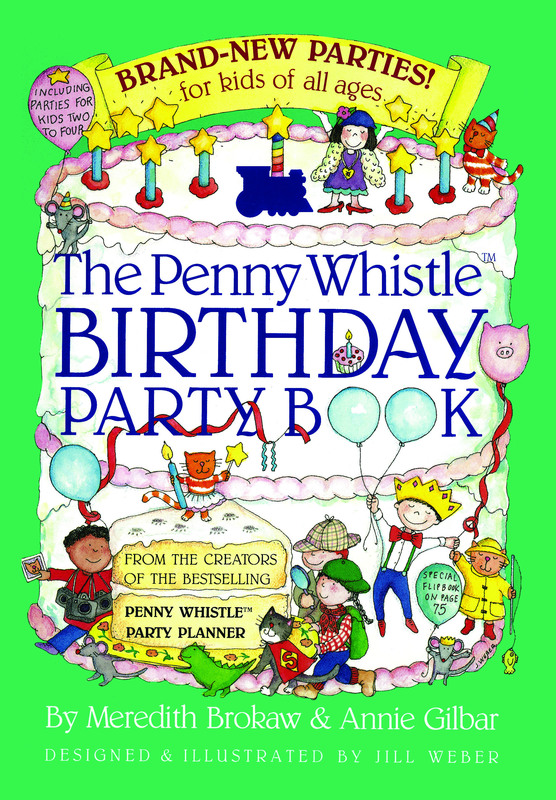 Half the work of party giving is in the planning and organizing stage; the Penny Whistle Birthday Party Book gives you 32 complete party plans, from invitations to games to refreshments. Just follow the guidelines and suggestions, add a few of your own twists, and you'll have a success on your hands. This is your child's party, and not yours. He or she should share in all aspects of the planning and decision making involved in the birthday party. Even two-year-olds will let you know that they love superheroes or puppies or dressing up. You just have to listen. Dr. Lee Salk comments: "Your child's birthday is such an important social event in his or her life. It is a great opportunity for the family to come together and discuss things, for a child to participate actively in the decision-making process. Kids need choices, and this is a great time to give them the chance to make some." Consider what your child loves: What are his current passions? Who is her favorite hero? What games does he love to play? Ask what kind of party she wants and listen to the answers. Even if they present added problems or greater difficulties (you found a terrific puppeteer, but your son wants to have a scavenger hunt; he dreams of having an Olympics party with the entire class, while you had hoped to get by with a pizza party for six), try to compromise and fulfill your child's party dreams. And don't try to talk your child into having a party you would like -- chances are pretty good it will backfire! Several years ago Annie's son Marc dreamed of having a ghost party. Annie and her husband had planned a magic party and convinced Marc that it would be terrific. It was a good party, and Marc and his friends had a fine time, but several weeks later, Marc mentioned quietly, "Magic was fun, but I really wish I'd had a ghost party." Next year, he had a ghost party! Sharing the party planning process with your child will make him feel as if he is the most special child in the world. If you can arrange it, choose and make the invitations, decorations, and favors together. Choose the games together, and when you contemplate the menu, talk over the choices with your child. This does not mean that your child must have the final word on all the decisions, but if you consult him you'll be surprised how much more all of you will enjoy the planning process. On this special day it is important for both parents to be there, if at all possible. Parties with both parents present always work better. It's so easy to get carried away planning a party, but it's important to keep the process and the event in perspective. This is, after all, only a party, not an international summit meeting. If the unexpected happens, you will handle it. If a game is a bust, it's not a tragedy. Remember -- children just want to have a good time and don't need total perfection to be happy. A party is theater. Planning it is just like constructing a play: You have a beginning, a middle, and an end. Children do not arrive at the party all at one time, so you will need to keep the children busy as they arrive. You will find that each of our parties has a game that can be played by those prompt arrivals, and some have tasks designated for the early comers so they will feel welcome and at ease. SCENE ONE: This is when the activities take place. We have suggested games and activities in each party to fill at least two hours (depending on the party and the ages of the children). Planning more games than you think you'll need will give you the flexibility to move on from a game that the children don't like, or to add a game if they finish one sooner than you had planned. By building in these contingencies, you will never find yourself with children who have nothing to keep them occupied. SCENE TWO: At this point, the children will need to calm down. This is a good time to serve the food. They'll be seated, they'll devour the food, they'll sing the birthday songs, and will slowly begin to unwind from the more hectic activities. At some of our parties we have suggested several quiet table games the children can play. When they are done eating, you can gather the children around and involve them in the final activities, including opening the gifts, if you choose to do so. If you have made a videotape of the party, you can show it at this time. You can also help your child distribute the party favors. By this time the parents should be arriving to collect their children. If there are some children still waiting for their parents, gather this small group and let them help you put the gifts away. We have our own opinions on whether or not to have your child open his gifts at the birthday party, but the decision is yours. We've found that children like to open gifts in front of their friends, and their guests take pleasure in seeing the birthday child's reaction to the gift each of them has brought. After all, half the fun of giving a gift is seeing the recipient enjoy it! You might discuss the problem of the duplicate present. The gift a guest has brought is important to him, and he will be anxious to see a reaction. If your child already has the gift, a kind thing to say might be, "Thanks so much! I love this toy so much that I already have it!" If it is something he really doesn't like, suggest that he can be polite and say something simple like, "Thank you for your thoughtfulness," or "Thank you for this gift." Then there is the matter of thank you notes. If your child cannot write, make sure he thanks the guest at the time of the party -- and that's it. If your child can write, the thank you note is a very nice way of his letting his guests know that he really appreciated the gift. You'll find that in our parties we make a lot of things at our parties because the personal touch is simply more meaningful. In each party we have combined items that you can buy with those that you and your child can make. Take the time to try these; they are simple, and it will mean a lot to everyone that you took the trouble. Use our ideas or let them trigger your own imagination. The idea is not to outdo anybody else but rather to personalize your own party. Don't overdo; spending a lot of money may send the wrong message to your child. This is a child's party -- don't give it the feeling of a lavish adult extravaganza. Forget the fireworks; make a birthday banner yourself and your child will remember it forever. This is the birthday child's day, but that does not mean that his sister or brother must be ignored. Parent after parent we talked with told how they always included the siblings. (If he or she does not want to be there, it's easy to have him spend that time at a friend's house. But it seems that more often than not, siblings hate to miss out on any action going on at home.) Have the brother or sister invite his or her special friend over for that day. They can either play apart from the party or they can be helpers. You can also have the birthday child assign special duties to his brother or sister -- he or she could be in charge of a game, greeting guests, or collecting presents. Taking an active part in the party means not only being there at all times but participating in the activities. If the children are on the floor, get down there with them. If they are participating in a race or in the scavenger hunt, go along. You've already cooked the food and set the table; now share in the fun! Our friend Susan Strauss is a wonderful example of a mother who truly gets involved in her son Jonathan's parties. Many of her friends have been surprised when Susan, who normally dresses very fashionably, greeted them and their children at the door in full costume (she's been Supergirl, in red and blue tights, a handmade satin cape, and headband for a superheroes party and Tinker Bell for a Peter Pan party). When anyone asks Jonathan about his birthday parties, he always mentions that his mom "always dresses up just like me!" With such personal gestures, Susan has made his parties memorable and made Jonathan very proud. Give yourself enough time to plan a party. At the beginning of each party in this book you will find a "Get Ready" list that will help you prepare ahead of time for all the things you need to buy and make. If you can, begin about six weeks ahead. But if you find that you must begin to plan your party two weeks ahead, just follow our guidelines and everything will fall into place. You will make up the guest list for a pre-schooler. After the age of three or four, your child needs to be consulted. First, how many children do you invite? A rule of thumb that some people use is to invite as many children as the child's age (a five-year-old, for example, would invite five children). The benefit of having a small group is that it's easier to handle the guests and give each child the attention he needs. If your child's teacher has asked that no children be left out of a party, this means that the entire class must be invited. Relax. Don't panic! Most of our parties are flexible and can easily accommodate 20 kids or so. Some parties lend themselves to inviting neighbors, relatives, and friends outside of school. If you would rather limit the number of children at the birthday party, you could have a separate family dinner to celebrate the birthday. Almost all the Penny Whistle parties can be enjoyed by boys and girls (although you may feel some, like the "Doll Shower," are more appropriate for girls alone). Before age five and after age ten, boys and girls like to attend parties together (in between they often profess to not being able to stand each other). The choice of inviting girls or boys or both is up to you and your child. You do not have to give a party alone. Get help if the size of your party demands it. Ask your neighbors, relatives, or friends to help the day of the party. Hire some high school students to help organize or to entertain the children (see our suggestions under each party for using high school kids). Since you know your child best, you should decide whether a particular theme is right or not; The Penny Whistle Birthday Party Book will guide you to the suggested age range for each party. While we have included a section totally devoted to parties appropriate to children ages 2, 3, and 4, there are also several parties suggested for older children that will also work for many four-year-olds ("Chocolate Factory," "Doll Shower," "Giantland," "Gone Fishin'," "It's a Dog's Life," and "Under the Big Top"). Don't assume that 11- or 12-year-olds don't like games. They may try to act older and more sophisticated but playing games also takes the pressure off trying to be cool and so grown up. Chances are they'll participate with enthusiasm! Children don't need to be urged to grow up any faster. If other mothers are urging girls to have boys at their parties or giving makeup parties for eight-year-olds and this seems inappropriate for your child (and your child is uncomfortable with such plans), buck the trend and stick to your guns. Knowing your own values and the personality of your child will guide you in making the decisions that will make you and your child happy. One of the best things about the Penny Whistle parties is that they afford as much flexibility as you want and need. We have designed and organized complete parties, but many of their parts are interchangeable. If your child is planning a "Star-gazing" party but also can't wait to play one of the games included in the "Camp-out," just add it to your "Stargazing" party. The same is true for our suggestions for favors and menus. It is our hope that the ideas you read about here will trigger your own imagination. Really successful parties do not need to be expensive. That's why you will find that we list a choice of items you can buy or make according to your time and your budget. This is a party for your child and his friends. It need not impress other parents; it is not supposed to make headlines or set any records. It should be fun at the time and fun to remember later. Take lots of pictures! Both you and your child will want to remember the party. Assign this task to some of your helpers, and start when the guests arrive. Use your video camera if you have one (you can also rent one) and play the tape back at the end of the party -- the children will love seeing themselves! Polaroid photographs of each child make wonderful party favors. If you are using 35-mm film, you may want to duplicate special photographs of the guests and send them to the parents after the party. Neiman Marcus catalog A must for discerning parents. Mundelheim Review Worth every cent...parties you and your children will remember with genuine happiness.